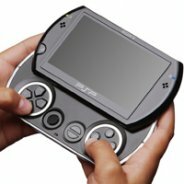 The new PSP is nearly here! Have you pre-ordered one for yourself yet? As most of you already know, the PSPgo is the smallest and mightiest PSP system yet and features 16GB of internal memory, as well as expandable storage to handle multiple applications – games, videos, photos, music, Internet and more. There is also no UMD drive so you won’t have to carry those pesky discs around anymore. Gran Turismo for the PSP launches this Thursday, after years of waiting. Stephanie Toshimoto, over on the PlayStation.Blog, has posted the TV ad campaign for everyone to view (see below). The advert centers around the Corvette ZR1 vs. PSP racing against each other on Mazda Raceway Laguna Seca in Monterey, CA. And be sure to check out our newly re-designed Gran Turismo website that launched last week where you can find the latest news, trailers, and content.